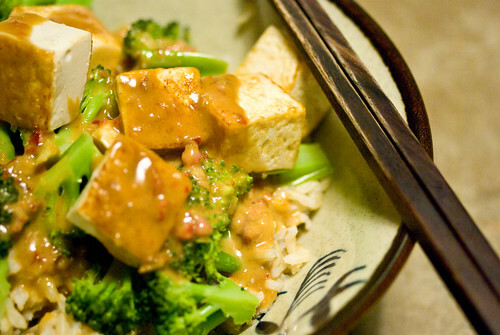 A while back I wrote about tofu with broccoli and peanut sauce. One of our favorite easy weeknight meals, it has evolved through various permutations, and I really like where it is right now. We’ve actually eaten it twice in the last two weeks – partly because Jon is still on meds that don’t allow alcohol, so we’ve been having a lot of things that go with Oolong tea, but also because it’s really, really good. My current approach is to sear cubes of silken tofu in peanut oil until hot and crispy on the outside, piling it onto bowls of brown rice with steamed broccoli (we do still make it with buckwheat soba occasionally, but it gets extra gooey – brown rice is easier to mix). Over this goes my new favorite peanut sauce, which I found in Deborah Madison’s book on tofu. It’s easy to mix up from pantry ingredients (as long as you keep Chinese black vinegar in your pantry), which makes it a great emergency recipe. We always have a few boxes of silken tofu on hand these days for just these occasions. I can’t really explain why this combination of flavors is so good, but you’ll have to take my word for it. Everything gets combined in the bowl, creating a rich, salty-sour-hot amalgam of good things. Try it! Mix together the peanut butter, garlic, soy, vinegar, sugar and hot sauce until combined. Add hot water until it reaches the consistency you want. Taste and adjust seasonings as necessary.